I don't have much experience trading and wonder why there was a large change just when the market opened. I daytraded my portfolio and started only recently. As expected, in the morning when the markets opened on friday day before yesterday, there was a large change very fast when the markets opened. Is that a common phenomenon and if so, why? Is it because batch orders are processed and change the prices in the morning, and therefore we can expect larger changes in prices in the early hours of trading just when the markets open? Today (Monday) it happened again. There was a large immediate change in prices directly when markets opened. It might seem that volatility is higher in the early hours? http://www.marketwatch.com/optionscenter/calendar would note some options expiration this week that may be a clue as this would be the typical end of quarter stuff so I suspect it may happen each quarter. Triple witching occurs when the contracts for stock index futures, stock index options and stock options expire on the same day. Triple witching days happen four times a year on the third Friday of March, June, September and December. Triple witching days, particularly the final hour of trading preceding the closing bell, can result in escalated trading activity and volatility as traders close, roll out or offset their expiring positions. June 17 would be the 3rd Friday as the 3rd and 10th were the previous two in the month. You may simply be asking why stocks 'gap up' or 'gap down' when the stock market opens. This is because the price adjusts to news that occurred while the exchanges were closed overnight. Perhaps Asian stocks crashed, or perhaps a news story was released in the New York Times about some major company. There are thousands of factors that affect market sentiment, and the big gaps that happen at the open of every trading day is the price of the stocks catching up to those factors. There are lots of good answers on here already. There are actually lots of answers for this question. Lots. I have years of experience on the exchange feed side and there are hundreds and thousands of variables. All of these variables are funneled into systems owned by large financial institutions (I used to manage these - and only a few companies in the world do this so not hard to guess who I work for). Their computers then make trades based on all of these variables and equations. There are variables as whacky as how many times was a company mentioned in an aggregate news feed down to your basic company financials. But if there is a way to measure a company (or to just guess) there is an equation for it plugged into a super computer at a big bank. the calendar day has changed. Meaning that every equation has a new output. computers unless programmed only know yes or no. They are binary. So if they are programmed to buy something then they buy it. They don't wait to see how the morning rushed turned or until they have had coffee. You should see a raw feed for NASDAQ and watching the big bank computers dueling each other at market open. I have had 2 milliseconds of raw market maker info from NASDAQ too big to open in a notepad file. Now most of the rest of the day is also automated trades but by the time you are an hour into market open the computers for the most part have fulfilled their calendar buys. Everyone else's answer is right too. There is futures contracts that change, global exchange info changes, options expiring, basic news, whatever but all of these are amplified by the calendar day changing. The gap up/down and rapid movement immediately following market open is due to overnight futures activity. In your example, SP500 on June 20, 2016 saw a 20-point gap up at market open. This was because the SP500 futures were trading 20 points higher at 9:30 AM than at its close on Friday. The index will always "catch up" with futures at market open. You can see that below. 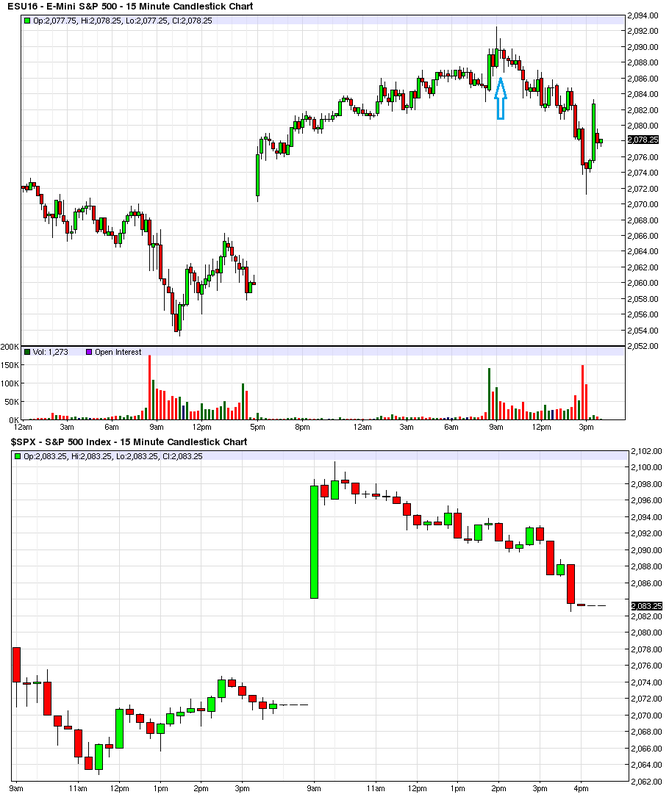 The top chart is the E-mini SP500 futures from Sunday night to Monday. Beneath it is the SP500 index. Not the answer you're looking for? Browse other questions tagged stocks investing volatility day-trading nasdaq or ask your own question. Is it possible to quantify the probability of sudden big movements for a high-volume stock? Why do both stock and bond seem overvalued in 2014? Is there a sell-side version of dollar-cost averaging? Is it possible to improve stock purchase with limit orders accounting for volatility? Which risk did I take winning this much? Can a broker refuse to place my limit-orders?